Sick of losing your socks to the infamous Sock Monster? sockTABS are the perfect solution to this common problem. Never lose your socks again with sockTABS! Every Sock Has a Mate, Let's Keep it That Way! 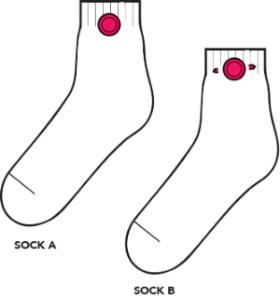 sockTABs is a wearable solution to the missing sock, and ultimately a simple, discreet and effective product to combat the infamous sock monster. Anyone with feet who wears socks and is tired of matching and searching for socks and eventually purchasing new socks to replace the countless socks with no mates. Tab It, Wear 'Em, and Wash 'Em. Wings in or Wings out! You can wear them two ways. The wings can either be worn inside of the sock/against your leg (Sock A) OR the wings facing outwards (Sock B.) Try them both ways and tell us how you like to wear your sockTABs!